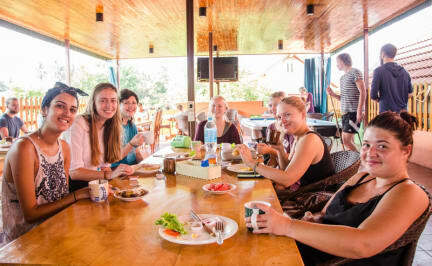 Vongprachan Backpackers Hostel is situated in Luang Prabang, 300 metres from Mount Phousy and 400 metres from Night Market. Guests can enjoy the on-site restaurant. Free Wi-Fi is provided and free private parking is available on site. Overall good hostel, but one drawback is that the wifi didn't work well especially during morning and night time when everyone is in the hostel and using internet so that I needed to go to cafe for looking up and making a travel plan. Nice rooms with good shower. Common area was good, and you could cook some food yourself. Good hostel, rooftop was nice to meet people, but it closes quite early. Beds were comfortable and my laundry smelled really nice! Not all staff speaks English that well, which was inconvenient at some times. Only issue we had was that the WiFi was not really usable and there was a lot of mold in the bathroom in our room. They give you about 10 different options for breakfast and had coffee all day. One of the best breakfast offered during my trip so far, there is quite a few options and free fruit as well! Served on the rooftop, which had a relaxed atmosphere. The rooms and bathroom themselves were quite basic but were clean and comfortable. OMG best showers ever, they were so warm! I didn’t really met anyone here, but sometimes that’s just how it goes. Stayed for a night and decided to change to another hostel. The hostel it’s self is pleasant but very quiet, hard to make friends there if your a solo traveller. Nice and clean and the shower was hot! Good balcony common room area with a nice view of the mountains! Fine and decently calm hostel. Nice and helpful staff. Rooms could be a bit cleaner. Communal area upstairs, depends on the people if you can easily mingle. The hostel was good. The atmosphere was fun as well. The staff were just very organised and overbooked the hostel a few times and ended up putting 7 people in a 6 bed room and running out of beds. But apart from the bad organisation it was fine. Average hostel. Wouldn’t recommend if you’re looking for a social atmosphere, found it difficult to meet other travellers. Rooms were very basic, good showers, AC in my room wasn’t very reliable. Overall an okay spot if you’re just looking for a bed for a night or two.